Minimize lean muscle tissue cannibalization. Welcome to the world's finest fuel specifically formulated for multi-hour to multi-day events. No matter how long or extreme your exercise regimen or races may be, Perpetuem is always up to the task. Thoroughly tested and proven in the world's toughest endurance events, Perpetuem's unique formula containing complex carbohydrates, soy protein, healthy fats, and key auxiliary nutrients such as sodium phosphate is unsurpassed for maintaining optimal athletic performance for as long as you want. Perpetuem provides consistent, reliable energy, maximizes stored fat utilization, and buffers lactic acid to prevent muscle fatigue. On the road or trail, Perpetuem is the breakfast, lunch, and dinner of champions. Take it long with Perpetuem! Carnosine, one of the ingredients in Perpetuem (it's also in HEED, Sustained Energy, and Recoverite), is both a performance aid (a superb acid buffer) and a premium general health nutrient (multiple free-radical scavenging and anti-glycation antioxidant. Never before has a fuel so complete and effective been available to endurance athletes prior to now. The container of fuel you possess is a result of several years of research and thousands of miles of testing in a variety of endurance disciplines; it is the first fuel introduced by Hammer Nutrition in over a decade. PERPETUEM represents the ultimate, never-before-available link to satisfying the body's fueling requirements no matter how long or difficult your exercise session or race is. Protein - A new calcium-enhanced soy protein isolate known as "XT" makes up nearly 10% of the caloric profile of PERPETUEM, the same percentage as is cannibalized during long slow endurance workouts. This particular soy protein contains a very high amount of intact, cardiovascular-enhancing isoflavones. Use as a primary source of calories during exercise/competition lasting more than two hours. IMPORTANT NOTE: Due to potential spoilage issues, Perpetuem cannot be premixed and left for several hours in warm weather. Please read the FAQ's below for more detailed information on this important topic. You can mix and consume Perpetuem three different ways depending on individual preference and logistical concerns. Please experiment with the following options to determine which works best for you. The One-Hour Bottle - Mix the suggested amount of Perpetuem for your bodyweight (see chart below) in a 21-24 ounce (approx 520-710 ml) water bottle. Consume one bottle hourly. This method is ideal when training or racing with a support crew and vehicle. If you're without a support crew but still want to use this option for mixing, keep in mind that it's obviously less convenient as you'll have to stop more frequently to mix your fuel drink. Also, because you are trying to fulfill both hydration and caloric requirements from one source, you have limited ability to adjust one without affecting the other; you may need to consume additional water to satisfy hydration requirements. The Multi-Hour Bottle - This is by far the most convenient method of fueling because it allows you to be self-sufficient for many hours, requiring only additional plain water along the way. The only limitation is how many scoops you can fit into a bottle. 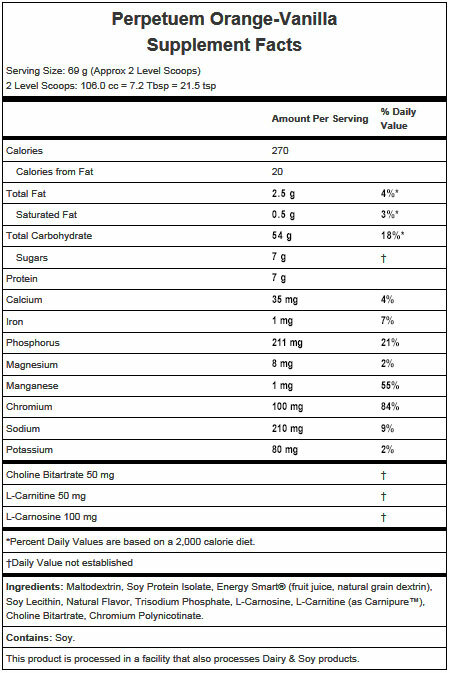 Determine your proper hourly intake of scoops by experimenting with the numbers from the dosage chart. Let's say you've determined through testing that 2 scoops of Perpetuem per hour is your ideal caloric intake. For a 4-hour workout, you'll need 8 scoops in a bottle, then filled with water and shaken well. You may need to add a few scoops at a time to get it all to mix well. You then nurse this bottle, taking small sips every 15-20 minutes. At this concentration, the water in the mixed bottle does not contribute much at all to your hourly fluid intake needs. To meet your fluid requirements, you carry a second and possibly even a third bottle of plain water, or use a hydration system, or know where you can refill along your route. Drink according to the temperature/humidity and your exertion level so that you consume in the range of 16-28 ounces (approx 475-830 ml) of plain water per hour. * This way, as long as you can obtain water along the way, you're set for hours of hard training. Gel or Paste - If you want to carry the highest volume of calories in the least amount of space, making a thick mix is your best option. 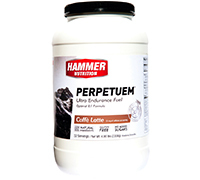 Perpetuem can be made into a super-concentrated, near paste-like consistency and dispensed from a Hammer Gel flask. Using a blender or bowl and spoon, mix scoops of powder with a small amount of water, gradually adding water as necessary to create the consistency desired. If you're using the orange-vanilla flavor of Perpetuem, remember that the heavier and more concentrated you mix it, the sweeter and stronger the flavor will become. You can also add Hammer Gel or HEED for flavor, if desired. Depending on how many scoops per hour you require, and how concentrated the mix is, each flask of Perpetuem can supply you with 2-4 hours of fuel. As with the multi-hour bottle, you must carry additional bottles of plain water or use a hydration system to meet your fluid requirements.